Combine all ingredients, just until blended. 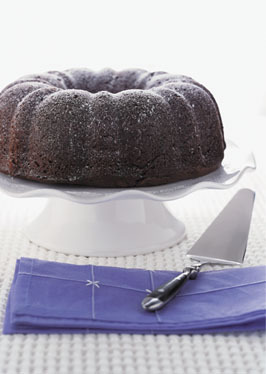 Put batter into an12" oiled bundt pan. Bake at 325º approximately one hour and ten minutes until done. When cool, dust with powdered sugar for a gorgeous presentation. This cake is good when baked the night before and chilled in the fridge. It is especially delicious served with vanilla ice cream and hot fudge sauce.